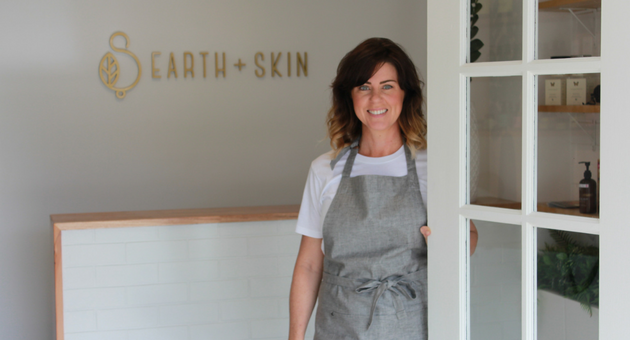 Meet Louisa Foote-Hollenberg, owner of Earth and Skin organic beauty spa. Married to Jon, Louisa is also mama to Annelise (5) and Jahn (4). 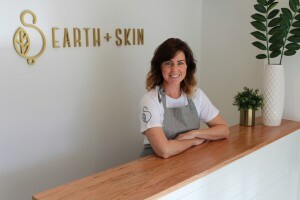 Earth and Skin is an organic beauty spa. We are passionate about beauty without toxic chemicals or harm to animals and the environment. Previously in Miami, we have just opened our gorgeous brand new organic beauty spa in Mudgeeraba. I became more interested in what I was putting on my skin after having the kids and couldn’t really find an organic beauty salon on the Gold Coast. I wanted somewhere I could buy great quality, local organic beauty products. I wanted to talk to someone knowledgeable about how to care for my skin without compromising my health or the environment and somewhere that I could go to have a beauty treatment done, knowing it was safe. I decided to open what I had been looking for. After two years operating my boutique salon, I saw a need for expanding the range of services that led us to build our new organic beauty spa. Now we can offer treatments such as Full Body Organic Sugar Scrubs, French Green Clay Body Cocoons and my favourite – the Rose Milk Foot Spa. My parents are classic entrepreneurs. They owned a nightclub in Surfers Paradise in the late 1970s just before I was born and after that had a broad range of successful businesses. 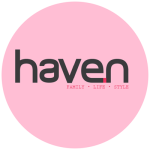 My mum ran a clothing manufacturing business behind the scenes for some big swimwear and cyclewear labels and my dad did everything from running a garden centre to mower shop to the stockmarket and real estate. I thought I’d buck the trend and decided to study to be a dentist but I got to my third year of uni and realised maybe it wasn’t for me. I finished that year with a degree in Oral Health Therapy. After having the kids, I found it difficult to find flexibility working for someone else. My sister (another entrepreneur) had just started her beauty salon so we worked together for a little while until I decided to open Earth and Skin. I think being an entrepreneur is in my blood, it feels natural. I have always been able to get advice from my family – the conversation often goes towards business at family gatherings. My biggest mentor though has been my husband. With a successful web design agency that he has owned and run for 10 years, he has provided lots of sound advice and has always been someone I look up to. We make a really good team. I learnt a long time ago that putting systems in place sets you free so being super organised is a must. I write a roster system that plans ahead including pick up and drop off, cooking meals, childcare and making lunches. That way everyone knows what is going on from the beginning and it eliminates some of the craziness. Mums all know that 10 minutes to yourself doesn’t just happen. You have to make that time – you have to schedule it in. I’ve just started boxing one-on-one with Dan from KO fitness and I love it. Boxing is such a mental and physical release and I always end on a high. Time to myself is a rarity so I enjoy taking a walk, reading a book or enjoying peace and quiet cooking something in the kitchen. Many days I wish I was on the receiving end of one of our treatments. I’m sure everyone thinks I must get facials or my nails done all the time but we are always so busy it never happens. We are extremely lucky to have an amazing au pair who lives with us. Helene takes care of the day-to-day tasks that would otherwise take us away from spending quality time with the kids. We use after-school care and kindy as well which the kids really enjoy. The kids (and Jon) love the skate park and we have a really good one near us that we go to every weekend. They are just getting confident on their bikes so we often go along the beach at Burleigh or to one of the parks near us. Jon and I love eating good food so you’ll usually find us at a new restaurant on a date night. We are so lucky that there are so many new amazing restaurants popping up everywhere it’s difficult to choose which one to try next. We often take the kids to Currumbin Wildlife Sanctuary. We also love going to Burleigh Headland and Mudgeeraba has some really nice family friendly walking tracks. Breakfast is my favourite meal and we try to eat out as a family on the weekend. The kids and I love the ricotta hotcakes at Barefoot Barrista! If we go for an early dinner we love Cha Cha in Broadbeach. I’ve been going there for years! It’s been a while but it usually involves a night in Brisbane. Dinner, drinks and dancing. I feel more on top of things when I’m organised. I’m a chronic list-writer. Jon and I decided a couple of years ago that if it is taking us away from spending time with the kids, it gets outsourced. I used to spend all day Sunday doing the family washing. Now our au pair does it during the week which leaves all weekend to spend quality time with the kids. I love what I do and it is always changing so I always find it interesting. Work no longer feels like work and my clients are like friends. I can’t wait to hear what they have been up to between visits. I really do feel like I have the best job.